Welcome to Handmade Monday. Come on in, make yourself comfy! Then Craftseller magazine arrived to cheer me up a little! I have two features in this issue. both bring a flavour of spring and both make great ideas for craft sellers to stock their craft stalls for Mother's Day sales. 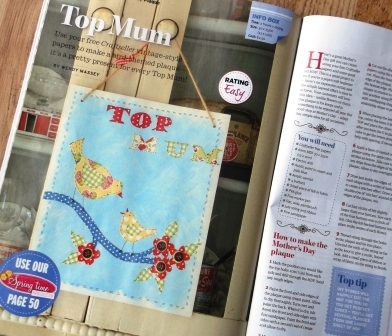 The templates and instructions for both are in the magazine, as are the vintage-style papers I used for the bird plaque! The double-sided free papers come as an insert and are great for other stuff too, like card making. There's also a free tote bag this month if you need an extra incentive to buy the magazine! Hi Wendy - can't believe I'm the first to comment this week. Sorry to hear about your Auntie. I'm off to my Mum (89)next weekend, and hope to install a new, cordless phone and explain it to her. At the mo, she misses most of her calls as the phone is in another room and she doesn't hear it. Lovely features for Craftseller, I esp like the photo frame. I can't believe its nearly mothers day too, I better get pepping, time is flying by. Sometimes real life is more important than crafting! Sorry about your aunty. I hope your mum manages to come to grips with the mobile I'm sure once it clicks she will never be off it lol. Lovely makes again. So sorry to hear about your Aunt, what a difficult week. I've just about got my mum trained to text on her mobile, but she's very nervous about using it as an actual phone! Oh dear - a week that matches the weather. You've made some lovely items and the articles look brilliant. The little birdie plaque is so pretty. I never did manage to teach Mum how to use a mobile - she found a cordless home phone enough of a challenge! Sorry to hear about your Aunt - it's 3 years since I lost my adorable Aunt Bertha. I planted a silver birch in her memory and love to see it grow each year. Hope everything perks up this week. I'm sorry to hear about he loss of your Auntie Wendy and the phone debacle... sounds like a trying time! Sorry to hear about your loss. Sounds like you've had so much on your plate this week that you deserve a bit of me time now. Your makes are so pretty as always. Sounds as if you have had a difficult week. Congratulations on the magazine appearances - your photo frame looks amazing. I am so sorry to hear about your Aunt. May her memory be eternal. I love your blog and Handmade Monday. Thank you for providing such a wonderful site for crafters! As per usual, the Craftseller projects are just great. I particularly like the frame. Am so sorry to hear of your loss Wendy, and all your problems with BT. 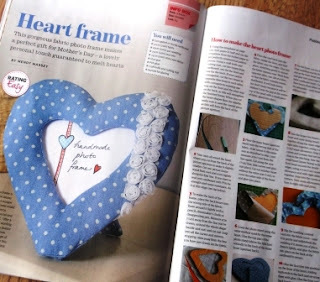 I loved your items in this month's Craftseller, especially the photoframe...really lovely in a non traditional non red valentines way! Sorry to hear about your aunt,not an easy thing to deal with on top of everything else.Love your posts in Craft Seller-I must check that out more.Glad to be back here-it seems like ages since I got round to posting. Definitely a week for family first - sorry to hear about your loss, hopefully the happy memories will help. So sorry to hear about your Auntie - sending a big hug. I hate it when stuff gets in the way of "work". I'm finding it so tough at the moment to keep up with orders and do general things. If I went off to an office to work, I'm not sure I'd find it so stressful. Well done with BT too. Our phone has been out for 11 days now and there is no sign of it being repaired! Husband was on his mobile to them for an hour on Friday to try and get something done to no avail - huge backlog, blah blah blah. Oh, and the offer of £1 a day compensation!! I have lots going on this week but I'm not as organised as I should be so I haven't got a post this week but I will try and get around a few blogs for a read. Have a good week. Sorry to hear of your loss, ((hugs)) sent your way. Oopps it looks like a rogue comment has crept in above. Sorry to hear your news. I don't why so many stressful things always happen at once. I hope this week is a better one and your makes in craft seller are lovely. Take care of you. Sorry to hear about your loss and your terrible week. Even when someone has been ill for sometime, it still comes as a shock when they finally pass away. Take time for yourself to remember your aunt. I'm loving what you had to share with us. As I'm typing I'm watching the birds on our feeder so will definitely be keeping an eye out for your card in Craftseller. So sorry to hear about your loss. But well done on getting the two projects in the mag - will look out for them! Btw similar problem with BT for my dad this wk, luckily he has a mobile! Sounds like a tough week and very sorry about your Aunt. BT, like computers, can be brilliant - go wrong and they are the pits. Good news about the car. Hope this week is calmer for you and your parents. My condolences too. Sorry to hear your bad news. It sounds like you had rather a tough and stressful week, hope the coming week is a bit more plain sailing. Sorry to hear about your aunt. Your week kind of puts mine in perspective. Hope your next week turns out better for you and your family. There are so many great crafts linked up at your party! I missed it this week, but I hope I can link up next week! New follower! I would like to recommend that you use the ultimate Forex broker.